A look at what’s new from Cisco, CounterPath, Dialpad, Symphony, and Serenova. Enterprise Connect starts Monday, March 12, with the TADHack-mini Orlando kicking off Saturday (see "TADHack-mini Orlando: Know Before You Go"). Even if the event has snuck up on you way too fast, there's still time to do a little prep and catch up on some of the latest developments from companies you'll find on the exhibit floor. This week's No Jitter Roll covers announcements around everything from networking, to contact center, CRM integrations, and team collaboration security from enterprise communications players Cisco, CounterPath, Dialpad, Symphony, and Serenova. In part to address demand rising from the surge of multicloud IT environments, Cisco this week announced intent-based networking enhancements aimed at providing better visibility into the WAN. "The fragmented nature of the WAN means that IT often has limited ability to specifically determine problems and get real-time information," Cisco said in its press release. Cisco now offers the capability to forecast WAN problems before they occur, so IT can isolate and fix issues when they do happen, the company said. Namely, the company announced Cisco SD-WAN vAnalytics, which provides visibility for IT forecasting and bandwidth planning, and Cisco Meraki Insight, which provides WAN and SaaS application performance metrics. Cisco SD-WAN vAnalytics is available now through a Cisco SD-WAN license tier, while Cisco Meraki Insight is slated to become available in Cisco's third quarter as a separate license. UC provider CounterPath this week unveiled its cloud-based collaboration solution, Stretto Collaboration. Stretto allows customers to add HD video, voice, messaging, presence, screen sharing, and collaboration capabilities to the CounterPath Bria softphone experience. As shown below, Stretto customers can use preferred devices and existing infrastructure, reducing the cost of the UC solution as well as the complexity, the company stated in its press materials. The solution supports desktop, mobile, and Web-based users, and is deployable via the Stretto Provisioning service. 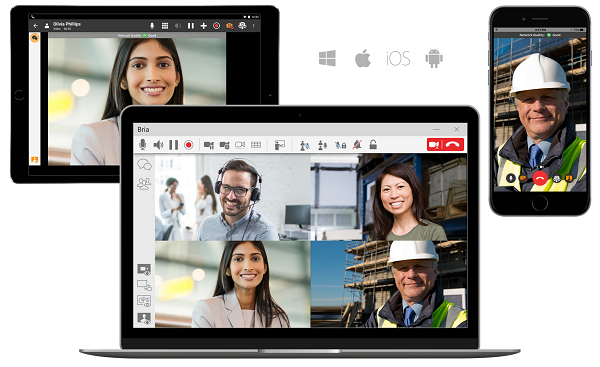 Additionally, Stretto allows users to manage video settings during live conferencing sessions; features one-click capabilities for joining meetings, screen sharing, and adding participants; includes rich hosting capabilities like the ability to assign video and presenter controls, and mute participants or rooms; and supports audio and video conferencing for up to 200 participants. Stretto Collaboration will be available later this month as a subscription add-on from the CounterPath cloud. Cloud communications provider Dialpad this week launched Call Center, the company's third distinct offering following on its UberConference and Dialpad offerings. It bills Call Center as a "new and modern take on call center software," the company stated in its press materials. Dialpad built Call Center on the Google Cloud Platform with a microservices architecture, and is targeting the service at small- and medium-sized businesses. Call Center features native CRM integrations to assist SMBs trying to manage their inbound or outbound call center needs. "By adding Call Center, we've made it easier for companies to focus on what's most important -- creating happy customers and generating business growth," said Dialpad CEO Craig Walker in a prepared statement. As for features, Call Center includes analytics on agent productivity and customer data; real-time alerts on key metrics like abandonment rates and wait times, delivered via email or SMS; the ability for supervisors to listen in on calls and coach agents; HD audio and intelligent call routing and queuing; and a unified platform with customized controls for easy onboarding. Call Center is currently available as an add-on for existing Dialpad customers, and will be made available as a stand-alone subscription in the next several months. Additionally, Symphony indicated that T. Rowe Price and another dozen financial services industry leaders plan to roll out Symphony Meetings -- delivered via the Symphony collaboration platform and protected by control and compliance features -- in the next several months. "T. Rowe Price's partnership has been a critical step as we bring Symphony Meetings to the entire financial services community," said Symphony founder and CEO David Gurle in a prepared statement. Contact center-as-a-service (CCaaS) and workforce optimization (WFO) provider Serenova this week released Skylight for CRM, featuring key integrations to Salesforce and Zendesk. With this solution, omnichannel interaction and routing capabilities are directly embedded into CRM solutions so agents have a single workspace for interacting with customers. With this integration, agents will be able to view a customer's full history across channels. "Customer experience -- the totality of customer interaction with your company -- has become a primary battleground for organizations, and yet, many are not equipped with the right tools to provide the best service possible," said Serenova chief product officer Matt Desplain, in a prepared statement. To solve for this, Skylight for CRM allows agents the ability to match inbound/outbound call information with CRM data; control calls and click-to-connect functionality; save call logs automatically; display CRM data with screen pops; and feed call data into CRM reports --- all from directly within the CRM system. Learn more about all these topics at Enterprise Connect 2018, March 12 to 15, in Orlando, Fla. Register now using the code NOJITTER to save an additional $200 off the Regular Rate or get a free Expo Plus pass.